The American MGB Association is North America's official registry for MGBs, MGB-GTs and Midgets. 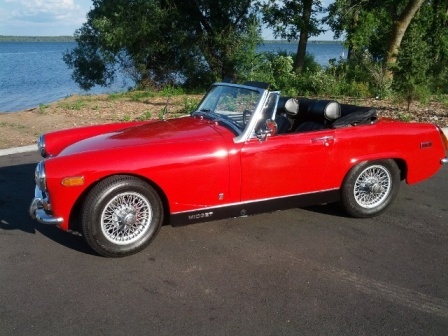 It is the largest and oldest club for MGBs, MGB-GTs and Midgets and is a nonprofit organization founded in 1975. 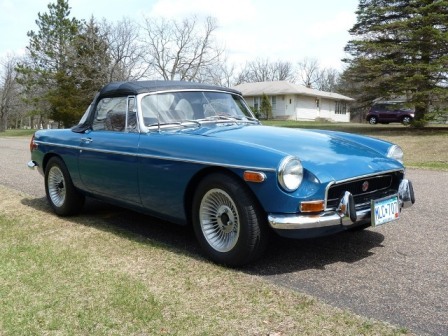 The AMGBA is dedicated to serving the interests of MGB, MGB-GT and MG Midget owners throughout North America. The AMGBA has held national meets throughout North America and now has members, technical chairmen and officers throughout North America and the world. Members receive publications which include the "OCTAGON" which is full page magazine, packed with MG news, topics, technical hints and tips, photos and articles on the MG, members' letters, events calendar and much more!! This is SUPPLEMENTED with the "eOCTAGON" which is sent to members that have given us an email address. Advertisers and participating organizations offer DISCOUNTS to members through the OCTAGON. 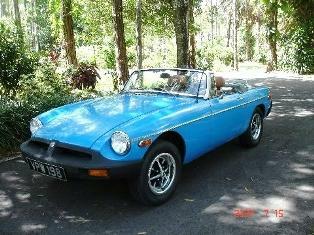 The American MGB Association offers and an online PHOTO GALLERY for members to share photos. AMGBA members receive TECHNICAL ADVICE from our technical staff. If you have a problem, call for immediate assistance or write and have the answer appear in the pages of the AMGBA OCTAGON which might assist other MG owners and members. The American MGB Association offers LOCAL, REGIONAL AND NATIONAL MEETS where you can join and meet with other MG owners. There are local chapters in many metropolitan areas. We invite you to join them. Each member receives an AMGBA MEMBERSHIP CARD, a WINDOW DECAL and a REGISTRATION DASH PLAQUE. The American MGB Association offers a wide range of REGALIA including T-shirts, golf shirts, sweatshirts, grille badges and more with the AMGBA logo. The American MGB Association has a WEBSITE MESSAGE BOARD, BLOG and SPARE PARTS EXCHANGE where members can get technical advice, post photos, correspond with other members and exchange parts with others. Follow us on Facebook and Twitter. The AMGBA offers FREE CLASSIFIED ADS to members which appear in the OCTAGON and on our website, in the Octagon magazine, the eOctagon, on Facebook and Twitter to sell, buy or exchange their cars, parts and other items. The American MGB Association offers MEMBER RECOMMENDATIONS on service and body shops and parts sources throughout the country. Just tell us where you would like service and we can tell you the closest location. The American MGB Association offers what no one else can - A TRADITION OF SERVICE to MGB, MGB-GT and MG Midget owners since 1975 with a proven track record as evidenced by our many members that have belonged for more than 30 years. Why? - because we are giving them what they want and need!! We would like YOU to become a part of this exciting and still growing club. Fill out the membership form or send us your mailing information and help us to become an even better organization, to form even more local chapters and help us spread the thrill of MG ownership and the fun of club activity!! You need what the American MGB Association offers. MEMBERSHIP is just $35.00 per year ($45.00 outside the U. S. A.) or $65.00 for 2 years ($85.00 outside the USA) or $95.00 for 3 years with free t-shirt* or tech CD ($125.00 outside the U.S.A. with free t-shirt* or tech CD). We accept VISA, MC, Discover and Amex. Join today or call for more information: 773-769-7084 .
eMembership is $25.00 per year (receive eOctagon and password which allows access to MEMBERS ONLY (2 year eMembership - $45 and 3 year eMembership - $65 with free t-shirt* or tech CD) site for one year which includes online versions of the Octagon magazine, tech staff contacts, member shop recommendations, etc. - details in members only section of the website, no membership materials). The benefits of eMembership are included with regular membership. *NOTE: Free t-shirts are available in Large, Extra Large and Double Extra Large and the color is based on availability but usually white. The American MGB Association is a nonprofit organization founded in 1975 in New York. From the club's inception through today the club is dedicated to serving the interests of MGB, MGB-GT and Midget owners throughout North America. The American MGB Association was started by John Giannasca and Rick Horan, the original chairmen. They thought it would be nice to have a club for MGBs just as there were club for other cars that people were driving new out of the showroom. They operated the club out of a spare room in the house where they live. It was there that the 111 Roger Avenue in Inwood, New York address was used. They advertised the club in Road & track and invited responses from prospective members for ideas in starting the club. The first newsletter was published in 1976 and contained some of the features still used today such as the Technical Section and From the Editor's Desk. In those early days, as the club continued to grow, it provided a way for people to meet other members in the same area who wished to start Local Chapters. It was this way that the Chicago Chapter of the American MGB Association was founded. Two of the most prominent American MGB Association members were there at the start of the Chicago Chapter - Bruce Magers, the current Vice-President and Steve Glochowsky, the past president. During the summer of 1979, our first eastern convention was held in Ithaca, New York with Floyd Garren as convention organizer. The enthusiasm was growing as evidenced by the turnout. On another promotional trip later that year, Steve and I went to a GOF, a 'Gathering of the Faithful' held by the New England MGT Register, in Cooperstown, New York. Rick Horan joined us in Cooperstown for this event. It was at this time that Rick told us about his new business and how it would be consuming much of his time. He and John were transferring the administration of the AMGBA to Steve and me. Steve quickly formed an administration with himself as President, myself as Vice-President and Debbie Glochowsky as Secretary. The conventions, now called Meets, continue to grow and to be moved around the country. The 1980 AMGBA National Convention was held in Glens Falls, New York. The organization's growth and success led to renting the world famous Indianapolis 500 Motor Speedway in 1981 for that year's AMGBA National Convention. In 1993, we traveled to New England at Keene, New Hampshire / Westminster, Vermont, the site of the Westminster MG Museum. Also in late 1993, Bruce Magers became the Vice-President. In 1994, we went for the first time to the San Diego, California area at the world famous Del Mar racetrack. In 1995 we traveled for the first time to Memphis, Tennessee. In 1996 we joined with all of the other major MG Clubs in North America for MG Indy '96 in Indianapolis, Indiana at the Indy 500 racetrack. In 1997 we were on the West Coast in the San Francisco area at Palo Alto, California. In 1998 we were in Charlotte, North Carolina at the Lake Campus of Davidson College. In 1999, we were in Los Angeles, California for the first time at Woodley Park near Van Nuys to join the British Car Meet. In 2000, we went to Armagh, Pennsylvania and joined with the TRF Summer Party. In 2001, we went to Houston, Texas for the Houston MG Club's All British Motor Vehicle Exposition and in 2002 we again went to the San Francisco, California area for the Palo Alto British Car Meet. In 2003 we were in Florida for the first time in Titusville, Florida and in 2004 we had a very successful Meet in Falmouth, Cape Cod, Massachusetts in conjunction with the Cape Cod British Car Club’s British Legends Weekend. In 2005, we were in San Diego, California at Fairbrook Farms in Bonsall for San Diego British Car Day. We were in Maryland in 2006 at the MGs on the Rocks Show and in 2007 we went to Charlotte, North Carolina at the MGs on the Green Show. In 2008 we were in Armagh, Pennsylvania with The Roadster Factory Summer Party and for 2009 we planned for a show in the Central Valley of California. In 2010 we went to Sussex, Wisconsin for the British Car Field Day. For 2011 we were in Ohio for the first time at Dayton in conjunction with the 27th Annual British Car Day at Eastwood Metropark. And for 2012 we went to the Jersey Shore to Ocean Grove, New Jersey to join in with Brits on the Beach 2012. In 2013 we visited Mississippi for the first time to the oldest city on the Mississippi River in conjunction with the English Motoring Club of Mississippi's Brits on the Bluff Show in Natchez, Mississippi. In 2014, we were at New England's largest British car show at the British Invasion in Stowe, Vermont. Meet 2015 was in South Carolina at the Grand Strand British Car Club's Britfest in Myrtle Beach. In 2016 we were in Virginia for the first time in Waynesboro at the Shenandoah Valley British Car Festival and in 2017 we made our initial trip to Alabama in Fairhope which is near Mobile and the Gulf Coast at the South Alabama British Car Festival. Future Meets will always be listed in our club member magazine, the Octagon, on our website (www.mgclub.org) as well as on our blog (https://mgclub.org/wordpress/), message board (https://mgclub.org/smf/) and Facebook (American MGB Association) pages. Remember that the American MGB Association, the AMGBA, offers what no one else can - a tradition of service to MGB, MGB-GT and Midget owners since 1975 with a proven track record as evidenced that many members that have been with us for more than 30 years. Why? - because the AMGBA gives them what they want and need!! For more information contact the American MGB Association, P.O. 5433 N. Ashland Ave., Chicago, IL 60640 USA, call 773-769-7084, email: info@mgclub.org , website: www.mgclub.org .